A narrowboats journey through repair, cruising, and other joys of the english waterways. I am sure you are all on the edge of your seats awaiting the update from the scintillating travels of the Great Holiday day whatever. Somerton Deep is as picturesque and exciting as ever. There is nothing like a new chimney to shake of the cobwebs of the old blog. Cowburn and Cowpar motor boat 'Snipe' built in 1934/5, by WJ Yarwood and Sons. 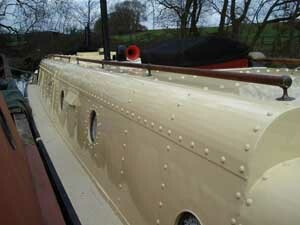 We are very proud to announce that we have just completed a re-paint for the famous historic Narrowboat Snipe. Snipe is one of the eight Cowburn and Cowpar motors built by Yarwoods around 1934/35 and named after birds beginning with the letter S. She was built with rounded chines and all steel construction . 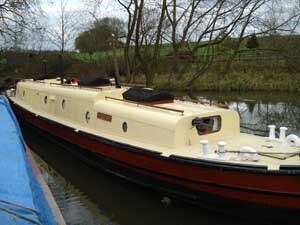 For many years Snipe was famously employed as a hotel boat, however she is now retired and based at Brinklow Boats. Her current owner commision the new boatman's cabin from Simon Wain of Brinklow Boat Services and the the main cabin was constructed by the owner himself, Mr Richard Wood. Painting by Mark Phelps and Chris Weston, Signwriting and Scumbling by Bob McIntyre and Roses and Castles by Bridget Matthews. Congrats to all envolved! Thanks to the owner, Richard Wood, for the use of these pictures. 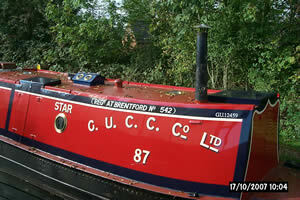 Star class motor boat number 87, "Star", built by Harland & Wolff of North Woolwich in 1935. Painted by Mark Phelps and Chris Weston in wartime 'Utility' colours. Signwriting by Bob McIntyre. Narrowboat "Star" is a Small Woolwich of composite construction (Iron and Elm), built by Harland & Wolff for the Grand Union Canal Carrying Company. The initial boats ordered from the builders above were nearly all named after constellations, stars and planets including names such as 'Aquarius', 'Sirius' and 'Venus'. These boats formed the 'Star' class. "During the Second World War the full company name that adorned the side of the cabin was abbreviated to its initials only. As you can see the design was simplified to save on labour and materials in keeping with the wartime government's 'Utility' drive." Thanks to the owner, Graham Robinson, for the use of these pictures. Samuel Barlow boat 'Beatty' built in 1937, by WJ Yarwood and Sons. New cabin painted by Mark Phelps and Chris Weston. Built in 1937, by W.J.Yarwood & Sons, of Northwich, Cheshire, for the Samuel Barlow Coal Company Limited. Beatty left Northwich in November 1937 for final fitting out by Lees & Atkins at Polesworth. Composite construction – Iron hull sides, Elm bottom. Originally fitted with a Petter single cylinder 12/14 hp semi-diesel engine. Currently powered by an Armstrong Siddeley 22 h.p. twin cylinder, air cooled diesel engine, fitted in 1955, believed to be one of the first of its type fitted in a narrow boat. Worked for Barlows for 22 years carrying coal from the Midlands coalfields down the Grand Union and Oxford Canals, her steerers included Harry Monk, John Blunn and Ray White. Sold to Jack Craddock of Wolverhampton in 1960 for conversion to an eight berth cruising boat. Timber cabin constructed by Waltons; fitted out by Jack Craddock at Brewood on the Shropshire Union Canal. 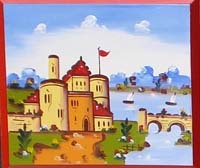 Bought by Martin Grundy in 1968. Used by the Grundy family since then for extensive cruising over most of the waterways system. 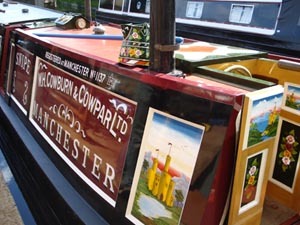 Beatty won ‘Best Converted Narrowboat’ at Guildford National Rally in 1970. The original timber boatman’s cabin was replaced in 1987 with a new steel cabin by David Harris at Coseley, near Wolverhampton. It has been refitted, using some of the old cabin furniture. 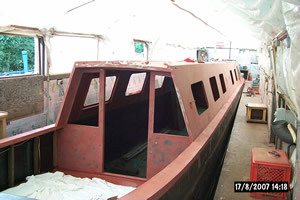 In early 2006 the boat was completely rebottomed, using opepe to replace the worn out elm. This also involved replacement of most of the keelson. 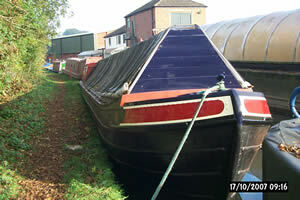 This work was carried out by Malcolm Webster on Worsley Dry Dock. The original timber conversion has now been replaced with a replica steel cabin, retaining the lines and style of the 1960’s cabin. 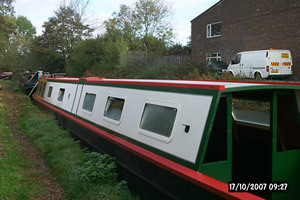 This work was carried out by Simon Wain of Brinklow Boat Services. The Tug 'Sharpness' built by Issac J Abdela & Mitchell, Stroud in 1908. Commisioned by the Sharpness New Docks Company and built at Brimscombe Port, Narrow Canal Tug 'Sharpness' was to be one of three wooden steam tugs based at Tardebigge. The other two tugs were the 'Worcester' and the 'Birmingham' both built by the same builder. She was one of the first internal-combustion-engined tugs originally destined for towing unpowered boats through the Sapperton tunnel which connected the Severn and Thames Canal. Several others of similar type worked on the Worcester and Birmingham Canal and the upper navigable reaches of the Severn. Sharpness was mainly used as a tunnel tug and was soon transferred for duties on the Worcester and Birmingham Canal, based at Tardebigge and Shortwood, where she was also an icebreaker. "The Sharpness and her sister boats the Worcester and the Birmingham had steel hulls and were roughly 45 feet in length and had a width of just under 7 feet. Their petrol or paraffin engines were 30 horsepower, turning a four-bladed screw." Thanks to the owner, Colin Palin, for the use of these pictures.